No other sport resembles surfing. The road is stable for runners, mountains are stable for hikers, turf and fields are stable for teams. They’re unmoving — consistent. Oceans, however, are fluid and unpredictable. Waves cannot be controlled or tamed. They will wake at ungodly hours and alter their schedule or sleeping habits to find a way to get in touch with this overpowering, natural force. It is admirable that surfers are so wholeheartedly dedicated to the element that gives them an arena to pursue their passion. But equally challenging is finding a healthy way to stay energized so they can keep up with Mother Nature. I have witnessed various eating habits that people have chosen. 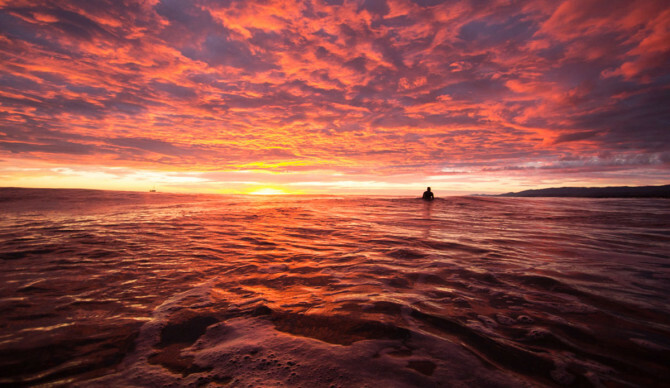 In Costa Rica, I met a guy who grabbed a cup of coffee then paddled into the early morning tide. One time I talked to a guy at a board rental store — he preferred a light breakfast, maybe a piece of toast or fruit. Perhaps this stems from to the old saying: “Always wait twenty minutes after you eat before going in the water.” No one wants to feel weighted down or cramped when they desire to float and glide. Nevertheless, hours running into and flying out of waves requires a great deal of energy. But what if there was something in the water that could sustain our energy? What if the ocean served not only the source for surfing but also the food that fueled surfers? Something that is instantly digested, promotes ample energy, has high protein, few calories and is organic. This algae is not the green flakes you feed goldfish. This is the algae that happens to be the most nutritionally-dense food in the world. I’m talking about organically grown algae, dried into tablets about the size of M&Ms. They contain no sugar, no chemicals, no caffeine, and no animal products or gluten. Boston-based company ENERGYbits leads the charge in acquainting athletes with algae, and they have quickly become the favorite fuel of marathon runners, triathletes and Olympic athletes. Now it’s time for the surf community to meet this food! ENERGYbits calls their tablets “bits” because they are “bits of food.” A typical serving consists of thirty tablets, which can be swallowed with water. At just a calorie each, these plant-based bits are a light, low cal, fat free snack that can increase your time on the water. Algae is ENERGYbits’s only ingredient. This compares dramatically with the average number of eighty to ninety ingredients found in a protein bar or shake. Earth’s first plant, it’s thanks to algae that the planet has oxygen. In fact, 80 to 90% of our oxygen comes from algae. Of the 15,000 types of algae, ENERGYbits Inc. grows chlorella and spirulina under organic conditions and without GMOs. Chorella: By taking a daily dose of chlorella you build your immune system, longevity, digestion, and RNA/DNA, while cleansing and detoxing your body and preventing hangovers! So have fun during the night and be out on the water with the sun. Spirulina: This contains the highest quantity of digestible protein of any food. Its protein comes as amino acids so it takes little time for the protein to break down and emit nutrients through your body — highly effective and efficient. This form of algae helps with athleticism, cravings and muscle gain. Aside from that you will strengthen your nails, bones, skin, and hair, vital to hours spent in salty waters. Algae has been used in Asia for over fifty years. It has been sold in the United States for the same length of time, but athletes and active consumers are only now learning about it. But in just a few short years, ENERGYbits has gained a following with runners, triathletes, NHL players, and Olympic athletes. It seems only natural that we surfers would also want to take algae. After all, why not fuel our bodies with something that is all natural and grown in water so we can unite our body and mind with the element we love? Water enables us to surf, clear our minds, and appreciate the world we come from. Let’s maintain the energy we need for that and to embrace the gifts of life we get from algae. Disclaimer: Danielle Frederick previously worked as an unpaid intern for ENERGYbits during the summer of 2014. She received no compensation for writing this article. The opinions are her own. Additionally, they do not necessarily reflect the opinions of the photographers.